Click to take our risk test. Click to see if you are ready. Click to find programs in your area. If you are a woman, have you ever been diagnosed with gestiational diabetes? Do you have a mother, father, sister, or brother with diabetes? 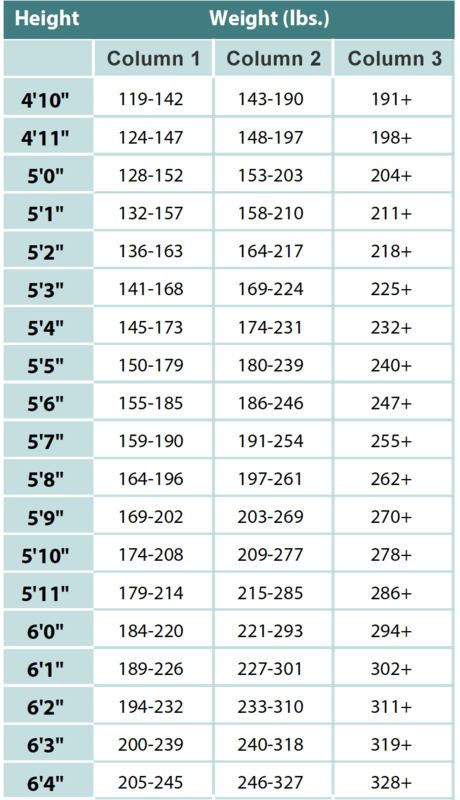 What is your weight category based on the chart below? Talk with your health care provider and take a blood test to find out your actual risk. If your score is 5 or more points, your risk is high for having prediabetes. You are eligible to participate in a diabetes prevention program. Enrolling in a diabetes prevention program is a year-long commitment. We want to do everything possible to make sure that you are prepared. Please answer the following five questions to help you decide if now is the right time for you to enroll. Are you motivated to make lifestyle changes that include eating healthy foods? Are you motivated to make lifestyle changes that include moderate physical activity (such as walking)? Are you able to manage current distractions in your life that may discourage you from committing to this year-long program? Are you committed to losing 5% of your body weight over the next 12 months? A 5% weight loss has been shown to reduce the risk of developing type 2 diabetes. Are you committed to a year-long program that includes attending at least 22 classes? If you answered NO to one or more of these questions, you may not be ready to enroll in a diabetes prevention program at this time. Explore what is holding you back and face those obstacles. In some cases, it may be a simple matter of timing. In other cases, you may need to assess what is preventing you from being able to answer YES to a specific question and take action in this area. You entered yes to all the questions and you may be ready to enroll in a diabetes prevention program at this time. If you have not already, take the Am I At Risk quiz to see if you qualify.